It's Halloween afternoon. An everyday boring sort of person finds a random invitation to a "murder party" occurring that night. It's in Brooklyn, and he doesn't even have a costume. Surely our hero wouldn't attend? 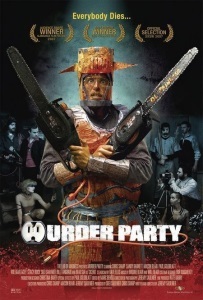 Find out the shocking answer in Murder Party, a low budget comedy horror movie from writer-director Jeremy Saulnier (who would go on to write-direct Blue Ruin and Green Room). This has a 100% critic rating on Rotten Tomatoes -- from five reviews, four of which have link rot. Available on Netflix in the US, and via Amazon in the US with a "Horror TV" subscription. I remember seeing this! Gloriously low budget but very very enthusiastic. The improvisation was hillarious. Also, Blue Ruin was fantastic if grim. I checked this one out a while ago based on a recommendation from horror maven Stuart Wellington of the Flop House Podcast, and it's a lot of fun on a teeny-tiny budget. It contains basically all the hallmarks of Saulnier's later work (tightly constrained settings and action, showing characters silently thinking and planning, etc.) as well as the humorous touches of costar/frequent collaborator Macon Blair's own noir comedy I Don't Feel At Home In This World Anymore. Highly recommended! I think I heard someone on MeFi recommend this, it must have been this comment by everybody had matching towels. I think it's probably my favorite film by Saulnier just because it's not taking itself seriously. And no small amount of points that the reason he goes to the party at all is because the cat sits in his chair. This is the second movie in a week that I saw here on Fanfare and immediately knew I had to see. I loved (almost) every second of it. The sodium pentothal scene and the rooftop chase both seemed to drag on just slightly too long, but side from them I had a great time watching this. I watched it this weekend because of this post.